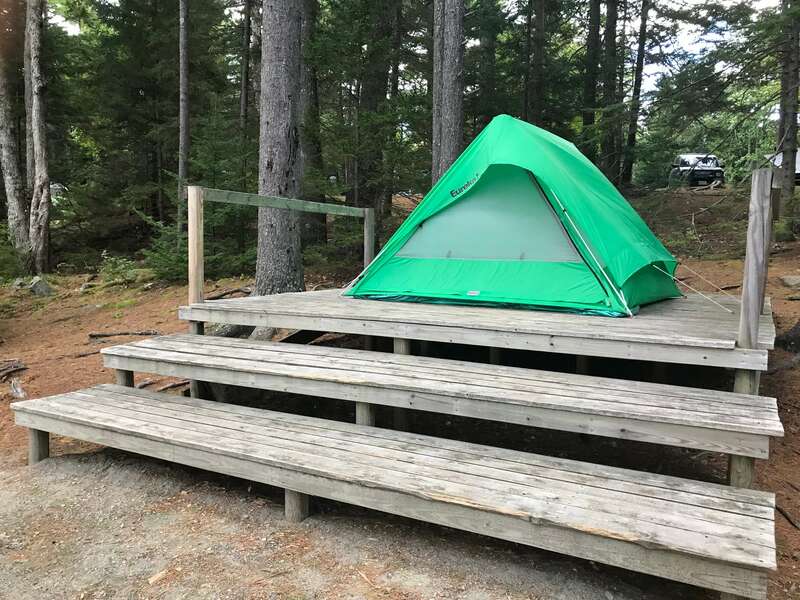 Our trip to Acadia National Park – one of the most visited national parks in the US, and only a three-hour drive from Portland – was full of adventure, starting with the potential for gale force winds and rain during our first night of camping! 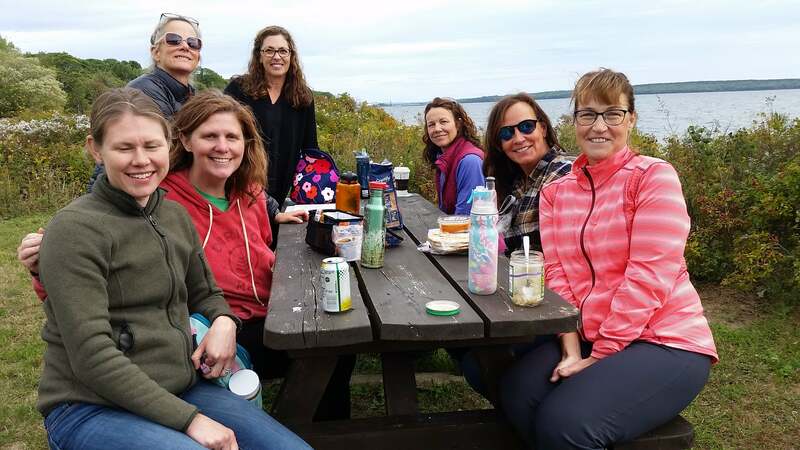 On Friday, most of us caravanned down the coast together, stopping for lunch and conversation at Moose Point State Park in Belfast. 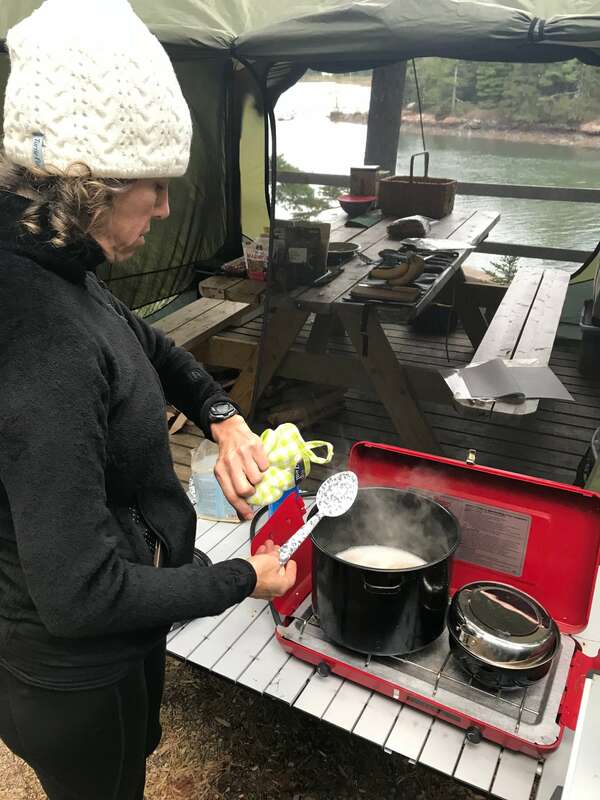 We found our six water-front campsites at Mount Desert Campground in Somesville and were glad Gillian had had the foresight to reserve the best campsites in the campground so far in advance. The sites were nestled on the cliffs under big white pines and had spectacular views of Somes Sound. Pesky rainshowers, new tents that needed to be figured out, nails to be hammered and lines to be tied to ensure that everything was secured well for the night made setting up camp a bit slower than anticipated. Thankfully the campground director checked on us (and our lines) and gave us a few tips on staking tents to avoid blow outs. Kate’s pre-camping preparations paid off as we made quick work of setting up the appetizers and prepared dinner of veggie packets in foil to cook over the campfire. 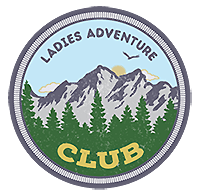 Good conversation, deliciously rich chocolate brownies that Patty brought, and a toast to adventurous Maine women completed the evening perfectly. Upon inspection (and to our surprise) our tent sites were in good condition Saturday morning- though some of our campers were a wee bit tired from lack of sleep due to the howling winds the previous night. 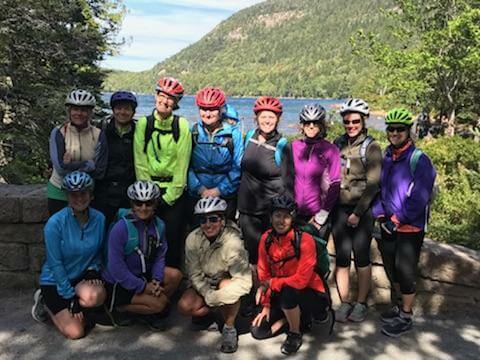 We geared up with bikes in Bar Harbor and headed out from town to the Jordan Pond House via Eagle Lake on the carriage roads. 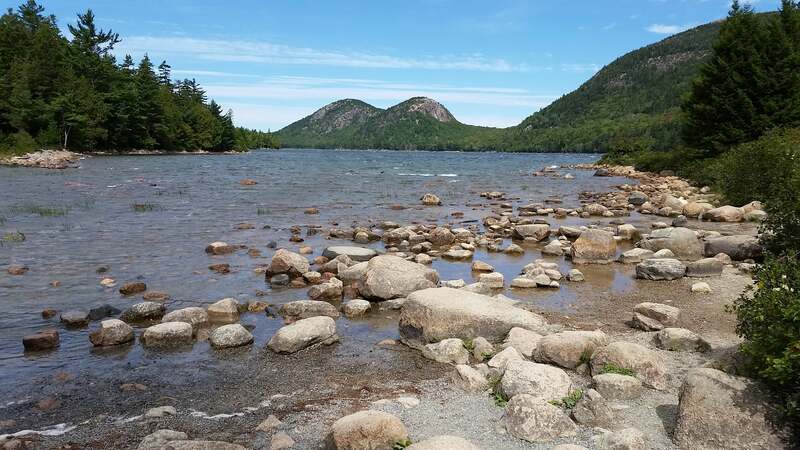 There are over 45 miles of carriage trails in Acadia, but this is by far one of the most popular (and one of our favorites). 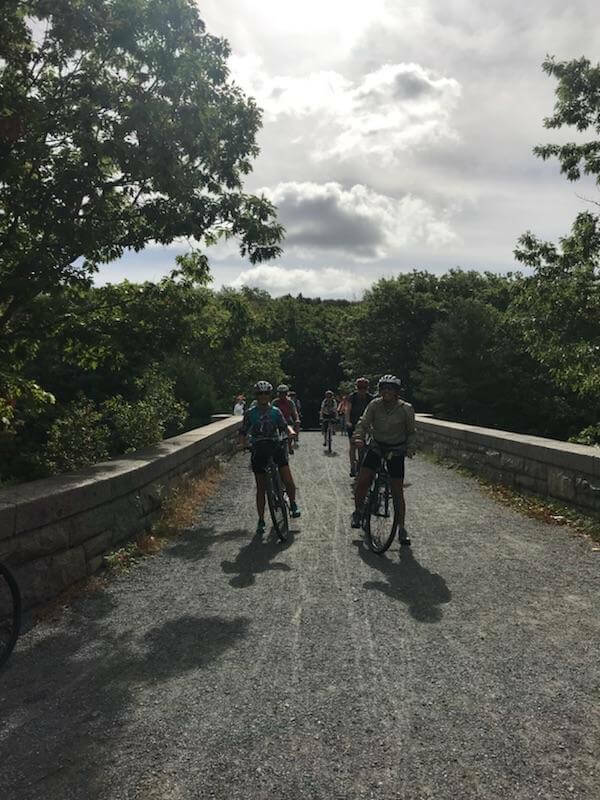 This ride begins with a with a long, up-hill climb, but once your make that turn through the gates and onto the carriage roads it is a fabulous route, with a little bit of all that Acadia and the carriage roads have to offer: gently sloping trails with beautiful pond and mountain views. 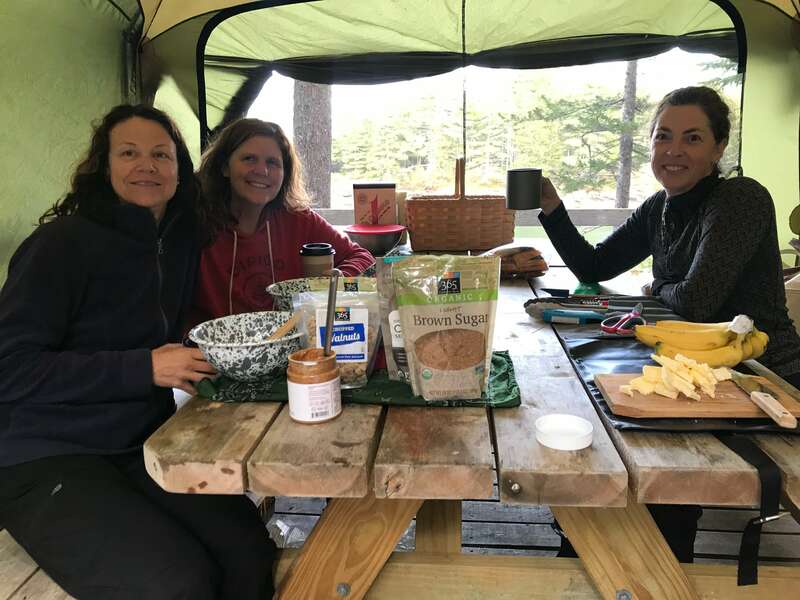 We were happy to reach the Jordan Pond House to enjoy lunch and the famous popovers (spread thick with butter and jam) on the porch with a great view of Jordan Pond and the Bubbles. After riding back to Bar Harbor and a brief respite back at camp we headed out to fellow LAC member Blanche and her husband David’s home in Northeast Harbor where David cooked and they hosted us for a lovely candle lit meal by a roaring fire. We witnessed a gorgeous sunset lingered on the beach watching the moon rise until it was almost too dark to find our way back up the path to the house. They topped off the night with an ice cream sundae bar, which included Blanche’s homemade chocolate chip cookies. This evening was such a treat and many of us didn’t want it to end! 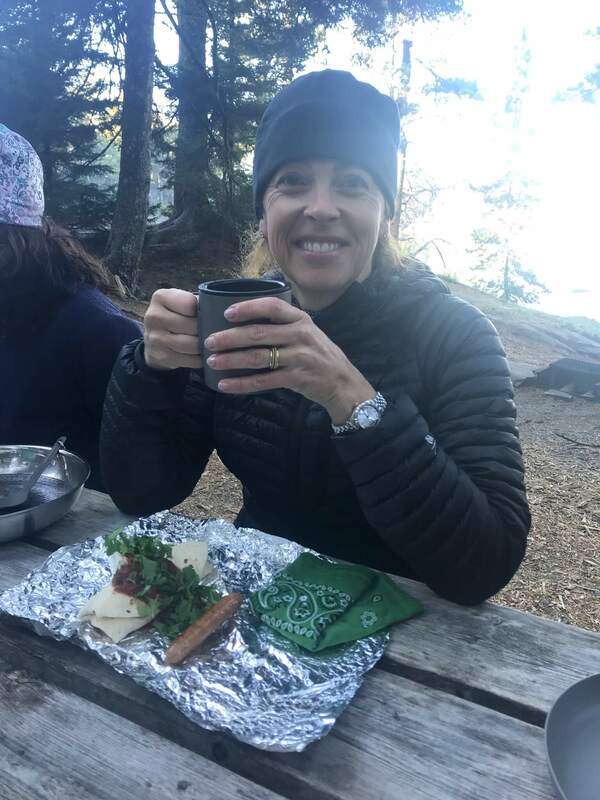 Sunday morning started with coffee and breakfast burritos cooked over the campfire, and everyone pitched in to build lunch sandwiches for our four-mile hike. Our moderately-strenuous hike took us over the bald peaks of Parkman Mountain (900’) and Gilmore Peak (1036’) and Sargent Mountain (1373). The Parkman Mountain Trail was beautiful and the 360 degree views from the summit were outstanding. We then took Grandgent Trail to Gilmore Peak and continued on to Sargent Mountain where we enjoyed lunch at the summit before taking the gradual Sargent Mountain South Ridge Trail and Hadlock Brook Trail down through the forested path back to the parking lot. This loop trail is rugged at times, with lots of ups and downs and a few rock scrambles – but the views of the ocean, islands, lakes and ponds are so beautiful we hardly noticed the effort. The Hadlock Brook Waterfall near the end of our hike was the icing on the cake – as we wrapped up our four mile, four hour hike. Sunday afternoon saw LACers going in different directions. Some climbed up to the Asticou’s Thuya Gardens to awaken their senses and take in the beautiful fall flowers and vibrant colors. 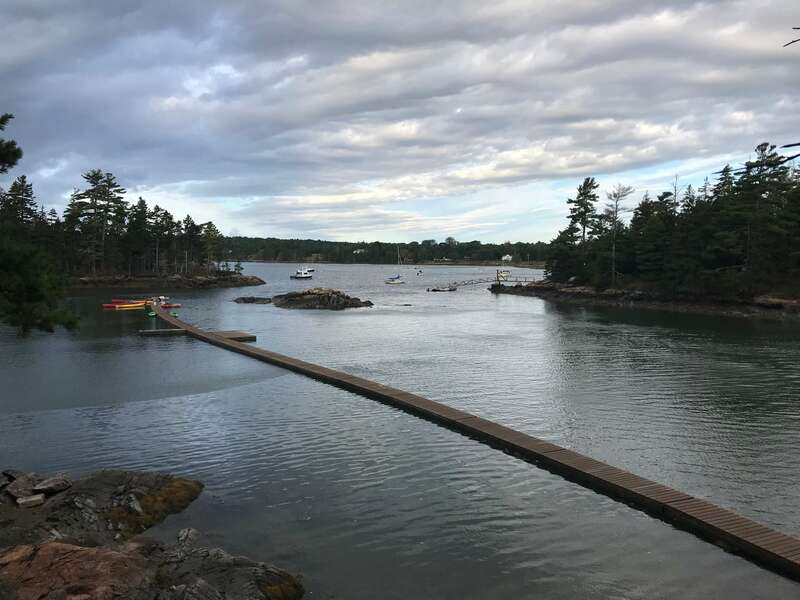 Others headed into Northeast Harbor to shop, and a few headed back to the campsite to swim, read and relax. We prepared a big pot of sweet potato stew for our final Sunday night dinner together while sitting at the picnic tables, sipping wine, telling stories, sharing experiences and learning about one another. At dinner we each had a chance to tell one another and the group what we were most grateful for over the weekend. There was a consistent theme in everyone’s response: We are all so grateful for Gillian, the founder of the LAC, and for this amazing community of women that she has brought together to explore Maine.